Summer is the best time of year to eat well. That isn’t to say “diet” but simply turning to the land to enjoy fresh vegetables, herbs and fruit at its very best. It is the time of year that I come my closest to vegetarianism because although I love and enjoy meats year-round, I can consume wonderful salads and entrées without a bit of meat or fish in them. A strict vegetarian would not condone the chicken broth I sometimes use to spike a cold soup, but a vegetable broth, though not as pungent, can always be used as a substitute. Some of our herbs and tomatoes become casualties of the summer heat around this time, but the influx of seasonal fruits and vegetables from cooler states and Mexico still fill the bins at the supermarkets. And local gardens maintain heartier herbs as well as squash, beans and corn. One of my favorite veggies is sugar snaps, which have taken a prominent place in most stores recently. They make wonderful dippers and stand alone as snacks that all ages seem to love. I was fascinated by an abundance of online recipes that use them in cold soups. I have borrowed from several of them to create the following recipe that will become a regular on my summer menus. It is cooling and soothing, and keeping cool is the name of the game in the New Orleans summer. I have outright snitched a Ben & Jerry’s recipe for a fantastic strawberry sorbet that my daughter stirred up in minutes at a recent dinner at my house. From rinsing the strawberries to serving up bowls of thick, succulent sorbet, she spent just a few minutes mixing and my small ice cream maker did the rest. This is going on my list with lemon ice as my favorite summer desserts. Two important tips for beginner cooks in dealing with summer vegetables are: To peel tomatoes, plunge them in boiling water for 30 seconds, one at a time, and cool for a couple of minutes. Use a sharp knife to remove the stem. Then the peeling will slide off without wasting any of the tomato. And: To roast bell peppers, place one at a time on top of a gas stove burner over a high flame. Let each side burn until blackened. Let the pepper set a few minutes off the stove, then scrape off all of the blackened skin with a knife. This gives the pepper added flavor. If your stove is electric, you can do the same thing under the broiler. For the next three months if I’m not in air-conditioning or a pool I’ll be at my farmers’ markets or fresh vegetable trucks stocking up on the lay of the land. I hope some of them will leave their peas and beans in the shells because, strange as it may seem to some, I think shelling them is great therapy. Combine the strawberries, sugar and lemon juice in a mixing bowl. Refrigerate, covered, for at least 1 hour. 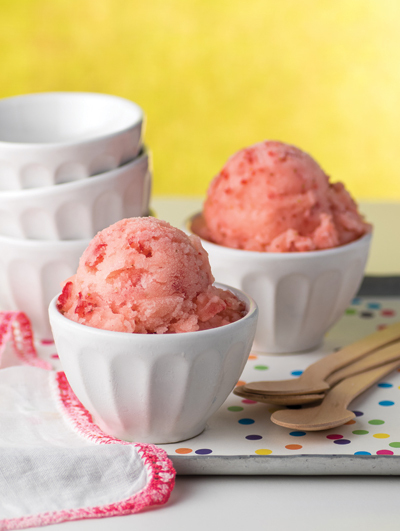 When ready to freeze the sorbet, mash the strawberries until puréed. Add the corn syrup and water, and stir until blended. Heat oven to 500 degrees. Place eggplant in a bowl, add 2 Tablespoons of the oil with salt and pepper and toss until eggplant is coated. Spread on a baking sheet and bake, turning occasionally, until eggplant is roasted, about 15 to 20 minutes. Set aside. Heat remaining 3 Tablespoons of oil in a large pot and sauté onion until transparent. Add bell pepper, red pepper flakes and garlic and cook 1-2 minutes more. Add tomatoes, capers and eggplant and cook for about 4 minutes. Add basil and cook 1 minute more.